Summer is all about low-maintenance style and natural, barely-there beauty. The heat, humidity, and warm summer rays call for a beauty routine focusing on minimal makeup, a neutral palette, and unfinished, effortlessly-chic strands. My go-to hairstyle for summer is the beachy wave: Simple and quick, a little mess and frizz actually adds to the casual, undone look. Perfect for warm weather, the textured, beachy wave doesn’t actually require a day of surf or sun. Here are my simple wet-to-dry steps to get the perfect tousled tresses for hair of every texture. Wash hair with a curl- or wave-defining shampoo and conditioner. Then, run a wide-toothed comb through your wet hair, and generously apply a wave spray all over, concentrating on the mid-shaft to ends (as opposed to the scalp). To create more volume for naturally straight hair, flip your head upside down and blowdry until it’s about 50% dry. Flip your head back over once hair is halfway dry and continue to blowdry. To create added waves and body, massage your hands throughout head as you blowdry. Don't use a brush, as straight locks will always gravitate away from holding a curl. Once your hair is 100% dry, use a curling iron to create loose curls. For longer hair, I recommend a 1 1/4-inch barrel. And, for shorter hair, choose a curling iron with a smaller barrel, approximately one inch. If you want tighter waves, opt for the one-inch iron, and if you're looking for slightly looser waves, choose the 1 1/2-inch iron. When curling your hair, section off strands starting from the back first and moving toward the face. Take two-by-two-inch sections (or smaller sections if you have very dense hair, or want the waves to be tighter), and begin wrapping the hair around the curling iron, leaving part of the ends out. Make sure you wrap the hair in a motion away from your face. As a general rule of thumb, wrap your hair around the curling iron for just a few seconds — the idea is to get texture without completely curling the hair. After the waves are in place, flip your head over and run your hands through the hair with a pomade, wax, or paste. Scrunch the ends to separate the strands and create added texture. 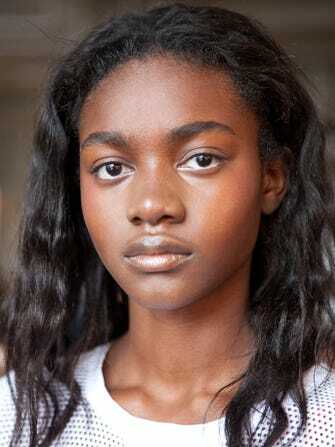 First, wash hair using a moisturizing shampoo and conditioner to relax and loosen the curl. Then, run a dime-sized amount of anti-frizz cream through your damp hair, using a round brush to quickly smooth out strands and tame frizz. Follow the same steps as straight hair, except make sure to use a larger iron. I recommend a 1 1/5-inch barrel; since hair is already naturally curly, strands will take the shape of the iron faster and easier. Then, flip your head over and run your hands through the strands with a serum or wave spray to add texture. Since curly hair is generally dry, stay away from using wax, which can further dehydrate your strands. At the end of the process, spend some extra time focusing on the hair line — curly hair often frizzes quicker, so smooth out the pieces that frame the face. Beachy waves are obviously easiest for naturally wavy hair, so the process is a bit quicker. Start by applying a moisturizing cream throughout hair and letting it air dry. If your waves are slightly unruly, go in with curling iron, mimicking the straight hair tutorial above (but use sparingly!). Then, finish with a wave spray. And, there you have it: the perfect beachy wave for all hair types. Whether you’re at the office or actually by the ocean, it’s simple to make sea-tossed waves and your go-to, easy beauty routine from now until Labor Day.